:Valves for hydro power projects are installed for safety, maintenance, and shut-off, as well as for flow and pressure regulation. 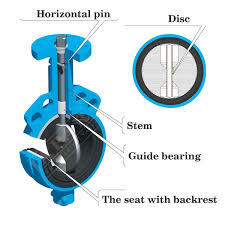 A Butterfly valve is a type of flow control device, which is widely used to regulate a fluid flowing through a section of pipe. This type of valve is mainly used as safety valve, turbine inlet valve, and pump valve for low to medium design pressures. 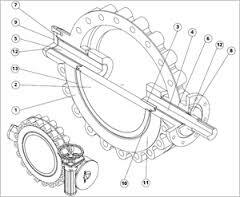 They are operated by oil hydraulic systems for opening and closing or by closing weight and hydraulic pressure for opening. For turbine inlet valves, oil pressure can also be taken from the governor hydraulic oil system. The sealing system is of flexible, adjustable rubber/metal type to reduce leakage to a minimum.Water flow through the valve is possible in both directions. Page created at 2019-04-26 18:46:34, Patent Auction Time.